Cheapest Resto Bill ~ Philippine Freebies, Promos, Contests and MORE! This is one of the Cheapest Bill I ever had in a fine dining restaurant, namely Italianni's. My uncle, GF and myself had a heavy lunch for only P648.13! If your thinking that we stuffed ourselves with the FREE focaccia bread, just check out the image bellow. A few days ago, my GF craved for pasta so I suggested we go to Italianni's Greenhills for lunch. My uncle from US came with us too. We ordered a Diablo pasta, a Wagyu and Salmon, and the Venetian Tower which comprised of Garlic Tuscan Toasts, Baked Mussels, and Italianni's Chopped Salad to share. Because I had the BPI coupon for Italianni's at hand, the Venetian Tower was FREE since the total bill was already over P1,500 for the Wagyu and Pasta. Sulit right? It was a good thing that all of us didn't have breakfast early that morning because our food was almost doubled! Wondering how? Here is how it happened. We started eating as soon as the Venetian Tower and Diablo Pasta was served. I could already feel that my pants was starting to tighten when the Wagyu and Salmon came out (did it look good!). I started to slice the steak and started distributing it. I then started on the Salmon and distributed it amongst ourselves. Just as we were about to finish the Wagyu and Salmon, my uncle complained to the manager because the Wagyu wasn't served hot (just slightly warm). Actually, the rice underneath the Wagyu and Salmon (it was a risotto I think) was hotter than the Wagyu and Salmon. The manager then said that they would give us a new one which came out in a couple of minutes. It was déjà vu, a good déjà vu haha. We then started to devour the Wagyu when my uncle once again complained complained to the manager that the Wagyu still was not hot. It was actually the same as the previous dish (the rice was still hotter). My uncle had a long talk with the manager about the steak's temperature and somewhere in the conversation, he asked if they could refill our Garlic Tuscan Toasts which the manager complied. The manager herself brought a new Garlic Tuscan Toasts and once again apologized for the Wagyu. We barely finished the toasts after that 2nd round of Wagyu and Salmon when the Bill came! I was astonished at our Bill! It was only P648.13 for everything we just ate! 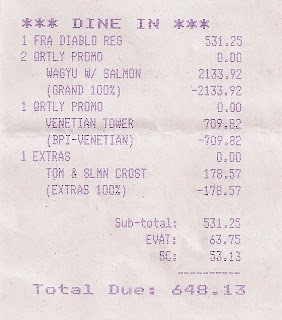 If you look at the picture of the bill above, the manager have canceled the Wagyu and Salmon from the bill (that was 2 dishes). The Venetian Tower was also FREE even if our bill didn't reach P1,500. They also threw in the Garlic Tuscan Toasts for FREE! So in short, we only paid for the Diablo Pasta. Talk about Italianni's Going the Extra Mile campaign. That time, they went around the world for us! That's what I call service!